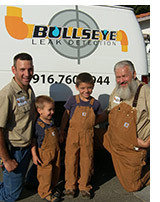 Bullseye Leak Detection has been growing steadily since 2008. 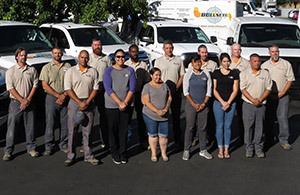 What started as a husband-and-wife team has expanded to a family of phenomenal technicians and office administrators. Founder and owner, Daniel Spatz, started working at a large leak detection chain when he was 19 years old. Within six months, he’d moved from apprentice to leak detector, building a foundation of skills in both plumbing inspection and repair. Over time, he developed his own systematic approach to detection work and began training other technicians in this style. While learning to scuba dive in order to perform pool inspections, he discovered a new passion. Daniel took every spare moment to dive and acquire new scuba certifications. Soon he had the training and skills to teach scuba diving and, at 26, was off to the Caribbean where, as a PADI instructor, he certified more than a thousand divers, managed a dive shop staffed and patronized by people from around the globe, and learned the fundamental value of life/work balance. A few years later, he was back in the States, refreshed and ready to start a business of his own, one focused on water conservation, teamwork, and an ethos of respect, professionalism, and excellence. And so Bullseye Leak Detection was born. Daniel continues to teach diving, now focused on the Bullseye team of pool inspectors, hoping that beyond their technical training they also might gain a bit of his passion for the underwater world. He also continues to train his staff in the systematic approach to detection work that he developed over his decades in the field. Bullseye prides itself on the highest quality service, the most skilled technicians in the industry, and an enduring passion for excellence. We are fully insured and licensed, with C36 Plumbing license # 935197.